Lana Del Rey Says Kanye Is "A Loss For The Culture"
Lana Del Rey isn't feeling Kanye West either. 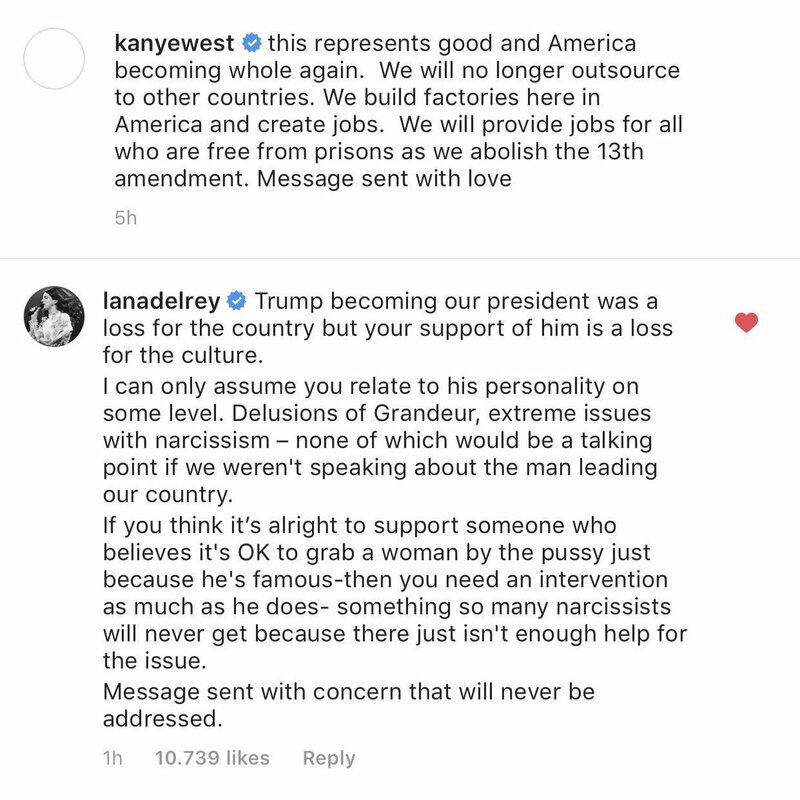 (AllHipHop News) Lana Del Rey has told Kanye West his support of controversial U.S. President Donald Trump "is a loss for the culture." The rapper has never made a secret of his backing of the former reality show host, but caused controversy once again on Saturday with a pro-Trump rant on TV show "Saturday Night Live." In the tirade, which wasn't aired, Kanye insisted Trump isn't racist and voiced his support for the POTUS as he sported a "Make America Great Again" baseball cap. The father-of-three also shared a selfie of him wearing the headgear on Instagram, and Video Games singer Lana, who performed at Kanye and Kim Kardashian's wedding in 2014, responded by taking aim at him. "Trump becoming our president was a loss for the country but your support of him is a loss for the culture," she wrote. "I can only assume you relate to his personality on some level. Delusions of Grandeur, extreme issues with narcissism - none of which would be a talking point if we weren't speaking about the man leading our country. "If you think it's alright to support someone who believes it's OK to grab a woman by the p##sy just because he's famous - then you need an intervention as much as he does - something so many narcissists will never get because there just isn't enough help for the issue." Kanye is just exposing the growing black conservative movement. I really wanna see what his endgame is. This man ain't stupid. He's doing something.